The Narrow Leaf Yucca is very common in the red rock foothills and canyons of northern Arizona and southern Utah. Its leaves are light green and typically about 15 inches long. From the center of the leaves, a flower stalk emerges in early spring and grows rapidly to about five feet. A long cluster of pale sphere-shaped flowers blooms in late spring. The fruit is a large, spherical pod with many medium seeds. When the pod ages, it becomes woody and splits open to disperse the seeds. Yucca root, known as amole, can be pounded and thrashed in cold water until sudsy, and is still used today as a shampoo. Native Americans used the narrowleaf yucca's sword-like leaves to make baskets and sandals. Yucca roots were used for soap, and the base of the plant was roasted and eaten. The young flower stalks of the Narrowleaf yucca were eaten occasionally, or roasted or dried for winter. 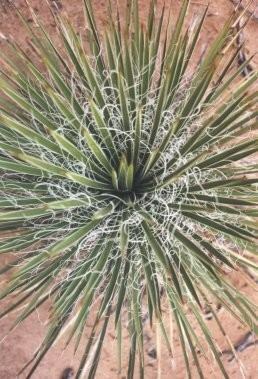 Yucca leaf fiber was the single most important source of cordage in the Southwest. The flesh was chewed off or soaked or boiled, and pounded to extract the fibers. Yucca fibers were used to make belts, sandals, nets, ladders, matting and baskets.